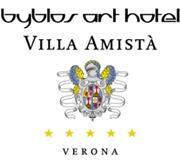 The Byblos Art Hotel Villa Amistà offers to all the EXPO 2015 visitors le opportunity to stay in a luxury structure outside of the EXPO rush. The 59 rooms of which 6 Junior Suites and 6 Suites all have their own character. A location of magnificent atmosphere to sejour and relax between the walls of an antique villa, re-designed in contemporary key thank to the extensive art collection exposed in every corner. The wellness center ESPACE Byblos, open also to the external clientele, offers a selection of treatments inspired by the European and Eastern traditions to ensure the complete relax of both body and mind.